When you think about trends in the marketplace, one of the most critical ones we’re seeing on the creative front is that healthcare companies – including everything from walk-in clinics to hospitals to health insurance companies - are doing a lot of hiring for user experience design. Up until recently, many of these organizations weren’t extremely concerned with the end user; just keeping up with HIPAA compliance and moving from a paper to a digital experience was challenging enough without adding this additional layer of design complexity. Getting healthcare professionals on board with the digital experience and getting patients “in and out” was of primary importance. But with the proliferation of mobile devices and amazing iOS and Android apps, patients have gained access to some incredible technology and have come to expect the same from their healthcare providers. End users, AKA patients, are unhappy with the customer experience and, as such, healthcare companies are turning to user experience designers to change this perception and to deliver the same top notch online interactions that these end users have come to expect from their banks, their wearable devices, and their favorite retailers. User perception and, subsequently, brand perception has become immensely important. The customer experience in healthcare spans every age, every demographic, and all geographies so there is a critical need for new ideas and technology that can make the design process more efficient and effective for maximum usability. 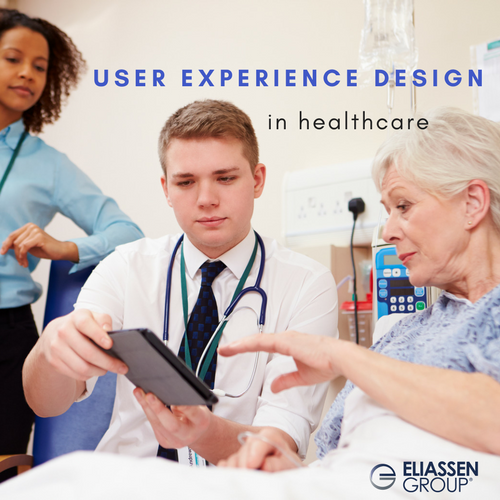 Here at Eliassen Group, we are regularly placing user experience designers for software display – tackling the big problems like medication management. When you consider how much human error exists in this particular area, it’s easy to see how usability designers can have a massive impact for healthcare organizations. For example, if you go to the emergency room (ER) and are then admitted to the hospital, healthcare workers must transmit the information/records from the ER to the hospital. In the past, much of this information got lost and this was a problem. Patients were often getting too much or not enough of a certain medication. The biggest struggles for healthcare organizations lie in getting their leadership on board with the concept that user experience is no longer a “nice to have;” these roles are critical if the organization is going to come out ahead of its competition. Beyond that, it’s about finding the right talent with the appropriate skills. Finding creative professionals with the necessary depth of experience to fill roles such as interaction designer, UI/UX designer, customer experience designer and design director can be quite challenging given the immense user pool involved in the healthcare industry. In a recent event at the Massachusetts Innovation and Technology Exchange (MITX), Robin Glasco, Chief Innovation Officer at Blue Cross Blue Shield of Massachusetts, spoke specifically about the challenges related to brand perception for healthcare insurance companies. The reality is that this industry is not viewed in a very positive light so the company has shifted course to a strong focus on the consumer experience and is working to design with “compassion in mind.” She went on to say that this type of design is not just a job; so many other things come into play. If you realize that many patients may only pay attention to their health insurance during times of deep personal stress and only access their benefits when something has gone wrong, you realize that this goes well beyond the capabilities of a typical designer. Start designing with compassion in mind. UX designers are trained on how to design with the user in mind. Let’s utilize them all we can. Talk to your customers! Find out what they want, collect data, and give listening a chance. No one can tell you how to make your product better than the people who use it on a daily basis so give them a listen. Spend more time on the process. Dive into the research, design, and redesign. This will save you time and money in the long run. Get the best talent! Allow someone to do the vetting process for you. Save time and money by handing the hiring process off to a professional group that knows the market. Are you looking for more insights to help you hire the right creative professionals? Reach out to us at solutions@eliassen.com.